From displaying your menu correctly to keeping your sauces in order, there is a point of sale display product available for every hospitality need. For restaurants, cafes, take aways and bars, it is key that your premises are tidy, clean and professional at all times. By introducing the correct POS you can truly enhance your displays and visual communication. Utilise all possible display opportunities today. I am a restaurant owner, what display products do I need for outside my business? People are easily drawn into a business if they see an offer or something appealing when passing by. 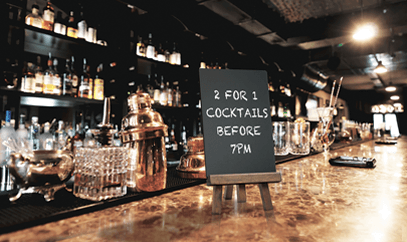 Pavement Signs and A Boards are a perfect way to bring in the passing trade as you can promote your early bird offer, drinks promotion or a new dish. A Boards are double sided for double the advertisement, too, which makes them a worthy investment for anyone in the food industry. If you have a window or door with a window, this space should be utilised as well. We recommend using Magnetic Window Poster Holders to advertise your menu, opening hours or policies even when you are closed. If your new pavement sign manages to get people to your window, they may wish to browse your menu before coming inside, so having this readily available is essential. What display products are best for take away owners? Again, pavement signs are a great addition to any food business. There is no better way to let people know who you are, where you and what you have to offer. 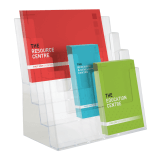 Once they are inside your business, Leaflet Holders are ideal for displaying your menus for people to take home with them ready for their next order. Counter Standing Leaflet Holders will work best for take aways, as the customer will see them when they collect their food and pay. Snap Frames can also work well for your weekly offers, lunch time specials or even to display your food hygiene certificate. I’d like to display my menu outdoors, what is the best way to do this? 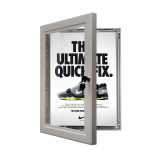 Lockable Poster Frames are a great way to display your menu outside without having to worry about your print being stolen or defaced. The lockable boxes are to be wall mounted, so would be ideal beside your door or window display where people can easily see it and view it at their leisure. There are also LED lockable poster boxes which will help draw in the passing trade with their round the clock illumination. My café is in a busy shopping centre, how do I manage the queues? If your facility is in a busy area or on a street, you should invest in some form of queue management system. 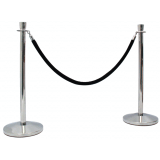 Simple Pole and Rope Systems are great and can be customised to fit your brand. There are also Retractable Barrier Systems which are easy to move around your business and bring in at the end of the day. At the head of your queue, you can introduce a Free Standing Menu Holder so that your customers can browse whilst they wait. How can I keep my bar looking neat and professional? Menus are constantly being left on bar tops creating a messy area for both you and your customers. To solve this issue, you can introduce Chalkboard Menu Holders. 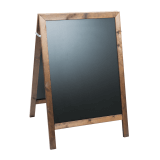 Chalkboards are a great addition as they can be updated quickly and regularly, are double sided and will not be picked up and thrown about, like a paper menu. The counter top chalkboards can tie in with the rest of your décor, with Wall Mounted Chalkboards and pavement sign chalkboards also available. 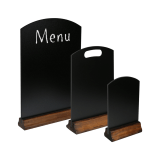 If chalkboards aren’t for you, Acrylic Menu Holders are another alternative that boast multiple display faces and again won’t be strewn across your bar top thanks to their sturdy upright design. I want to try and tidy up the dining tables in my restaurant, how can I do this? There are lots of steps you can take to help keep your dining areas looking tidy and welcoming at all times. Condiment Holders will encourage customers to put their sauces and salt and pepper back where they got them from rather than leaving them on the table. Tent Style Menu Holders are another great way to encourage customers to leave areas tidy and these can also double up as table numbers. This means you can save space by having a menu holder and table number in one. If you don’t have paper printed menus, Multi-Faced Menu Holders double up as a decorative addition to a table but are also informative and can be used to advertise and promote.